Vincent Connare designed the ubiquitous, bubbly Comic Sans typeface, but he sympathizes with the world-wide movement to ban it. The font, a casual script designed to look like comic-book lettering, is the bane of graphic designers, other aesthetes and Internet geeks. It is a punch line: "Comic Sans walks into a bar, bartender says, 'We don't serve your type.'" On social-messaging site Twitter, complaints about the font pop up every minute or two. An online comic strip shows a gang kicking and swearing at Mr. Connare. Typefaces convey meaning, typographers say. Helvetica is an industry standard, plain and reliable. Times New Roman is classic. Depending on your point of view, Comic Sans is fun, breezy, silly or vulgar and lazy. It can be "analogous to showing up for a black-tie event in a clown costume," warns the Ban Comic Sans movement's manifesto. The font's original name was Comic Book, but Mr. Connare thought that didn't sound like a font name. He used Sans (short for sans-serif) because most of the lettering, except for the uppercase I, doesn't have serifs, the small features at the end of strokes. Mr. Connare, 48 years old, now works at Dalton Maag, a typography studio in London, and finds his favorite creation -- a sophisticated typeface called Magpie -- eclipsed by Comic Sans. He cringes at the most improbable manifestations of his Frankenstein's monster font and rarely uses it himself, but he says he tries to be polite when he meets people excited to be in the presence of the creator. Googling himself, he once found a Black Sabbath band fan site that used Comic Sans. The site's creators even credited him. "You can't regulate bad taste," he says. Still, he is tickled by -- and trades on -- his reputation. A picture signed by Mickey Mouse that was sent to Mr. Connare to thank him after Disney used the font in ads hangs in his house. His wife, Sue Rider, introduces him at parties as the father of Comic Sans. A friend of his claims to know someone who broke up with her boyfriend in a letter written in Comic Sans to soften the blow. But there certainly hasn't been much money in it for Mr. Connare since Microsoft owns the font. Of course, there would be no movement to ban Comic Sans if it weren't so popular. "We've been using that font for years," says Peter Phyo, a manager at O'Neals' restaurant across the street from Lincoln Center in Manhattan. "That is just the procedure. I wouldn't know the exact reasoning. It also looks nice on the menu." Mr. Phyo says he hasn't had any complaints. The proliferation of Comic Sans is something of a fluke. In 1994, Mr. Connare was working on a team at Microsoft creating software that consumers eventually would use on home PCs. His designer's sensibilities were shocked, he says, when, one afternoon, he opened a test version of a program called Microsoft Bob for children and new computer users. The welcome screen showed a cartoon dog named Rover speaking in a text bubble. The message appeared in the ever-so-sedate Times New Roman font. Mr. Connare says he pulled out the two comic books he had in his office, "The Dark Knight Returns" and "Watchmen," and got to work, inspired by the lettering and using his mouse to draw on a computer screen. Within a week, he had designed his legacy. A product manager recognized the font's appeal and included it as a standard typeface in the operating system for Microsoft Windows. As home computers became widespread, Comic Sans took on a goofy life of its own. Out to crush that goofy life is Ban Comic Sans, whose weapons include disapproving stickers, to be slapped on inappropriate uses of the font wherever they are found. 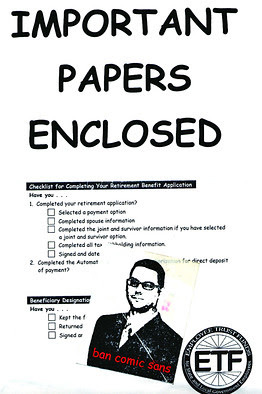 The 'Ban Comic Sans' group slaps its stickers on uses of the ubiquitous font, such as a retirement-benefits document. Ban Comic Sans was conceived in the fall of 1999, when Holly Sliger was a senior at the Herron School of Art and Design in Indianapolis, studying typography and graphic design. Designing a museum gallery guide for a children's hands-on artifact exhibit, Ms. Sliger says she was horrified when her bosses told her to use Comic Sans. She told them it was a cliché, and printed out a list of other typefaces she thought better suited the project. They insisted on Comic Sans. "It was like hell for me," she says. "It was everywhere, like an epidemic." In the midst of the project, she met her future husband, Dave Combs, at synagogue one Saturday. He was a recent college graduate working as a graphic designer, and she knew he would sympathize. "This is horrible," he remembers saying. She says, "That's when I knew he's the guy I would marry." The couple did wed a year later and continued to gripe about the font. Mr. Connare says he first realized that the tide had turned against Comic Sans in January 2003, while studying for his master's degree in type design at the University of Reading in Berkshire, England. He got an email from Mr. Combs asking for permission to use his photo for stickers, T-shirts and coffee mugs to promote "typography awareness" for the movement to ban Comic Sans that he and his wife had founded. Busy and distracted, Mr. Connare said OK.
"It sounded a bit silly," he says. He didn't think it would amount to much. But the Combses had global ambitions. A map hangs in their daughter's bedroom, marked with little red flags to show the dozens of locations around the world from which people have requested their stickers. "They're like parking tickets," Mr. Combs says. As the movement grew, Mr. Connare's image became the logo for Comic Sans bashing. Mr. Connare eventually, in February 2004, asked the Combses to stop using his picture, and they did. Today, Mr. Connare sometimes speaks at Internet conferences, using 41-page PowerPoint presentations written in you-know-what. He talks with the Combses about creating an "I Love/I Hate Comic Sans" picture book together. The font has become so popular that it's approaching retro chic. Design shop Veer is selling a T-shirt with a picture of human heart on it made entirely of tiny Comic Sans characters. 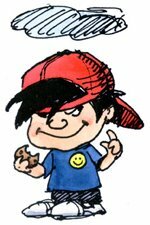 Veer's text: "Love it, love to hate it, or hate that you love it."